As part of the Edinburgh Art Festival 2009 The Grey Gallery presents an exhibition by Bob and Roberta Smith. Last year the Guardian newspaper asked the arts and sports writers to swap places for a day. Tennis correspondent Steve Bierley reviewed a Louise Bourgeois exhibition and his review is the subject of this exhibition. This Artist is Deeply Dangerous is an 11 metre painting which breaks down into 9 panels. Bierley's thoughtful article inspired Bob and Roberta Smith to make one of their largest works to date. Bob and Roberta Smith are interested in how texts are understood and having failed various tests for dyslexia as a child, Bob and Roberta Smith see texts as fields of information which sometimes swim before the eyes. The interesting things for Bob and Roberta Smith about Bierley's text are its incisive clarity and enthusiasm along with its mission to inform, three elements which rarely exist in the world of professional art criticism. Bob and Roberta Smith say 'There should be no artists, just people making art, and by the same token there should be no art critics, just people writing about art'. Bob and Roberta Smith was born in 1963. He is a painter and performer best known for brightly coloured words on recycled timber, and spelling mistakes. The resulting slogans are absurdist musings on art, politics and culture. In 2008 he was shortlisted for the Fourth Plinth on Trafalgar Square and in December of that year he made the Tate's first fully interactive Christmas tree Make your Own Xmas. Earlier this year his work was featured in Altermodern: Tate Triennial 2009, and at the same time his provocative third Billboard for Edinburgh was displayed at the Ingleby Gallery here in Edinburgh. The nomadic Grey Gallery works with artists, musicians and writers on a project by project basis, and has participated in the Edinburgh Art Festival for the past 2 years. Jock McFadyen in EAF 2007 and Richard Wilson in EAF 2008 were presented in the resonant dereliction of a disused warehouse courtesy of Lyon and Turnbull. This year Grey Gallery changes tack to take up residence in the opulent surroundings of the fabulous five storey Georgian house that is Hawke & Hunter. 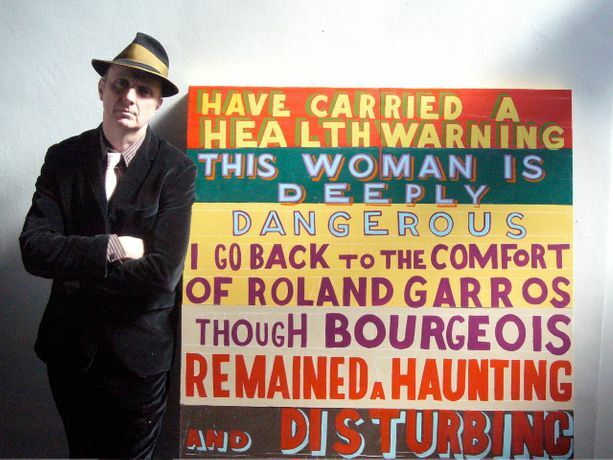 Bob and Roberta Smith will talk about his painting 'This Artist is Deeply Dangerous' with Guardian tennis correspondent Steve Bierley and Professor Andrew Patrizio, Director of Research Development at Edinburgh College of Art. The Grey Gallery acknowledges the generous support of Hawke & Hunter and Studio DuB. The Grey Gallery is participating in the 2009 Edinburgh Art Festival. The EAF is Scotland's largest celebration of visual art and runs this year from 5 August to 5 September. For further information on the Festival please visit www.edinburghartfestival.com, contact info@edinburghartfestival.com or telephone +44 (0) 782 533 6782.